Authored by a renowned expert in the field of hand and wrist surgery, Wrist Arthroscopy Techniques is a step-by-step, anatomically illustrated manual encompassing the latest concepts in the field. The development of arthroscopy for the wrist has evolved significantly over the past decade, with a better understanding of disease mechanisms and applications. 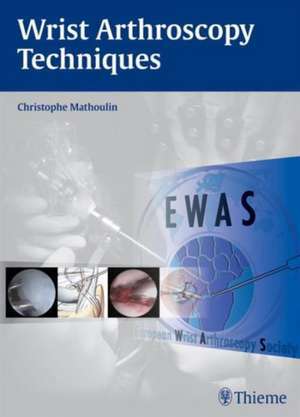 Starting with an introduction about instrumentation and techniques, readers will gain insight into how an arthroscope enables precise visualization and analysis of the internal structural make-up of the wrist. Each chapter provides a how-to, detailed procedural guide, from the point of incision to closure, accompanied by artfully drawn illustrations. The author shares clinical pearls and provides comprehensive explanations on treating specific conditions, including ligament tears and instability, complex fractures, dorsal and volar wrist ganglia, advanced arthritis, and fibrocartilage tears. Indications, risks, special precautions, and postoperative care are covered. Whether you are a seasoned surgeon or an advanced student, this comprehensive compendium is certain to be frequently referenced. An invaluable resource tool covering the state-of-the-art arthroscopic techniques, this is a must-have for all hand and wrist surgeons, as well as for orthopaedic and plastic surgeons and residents.